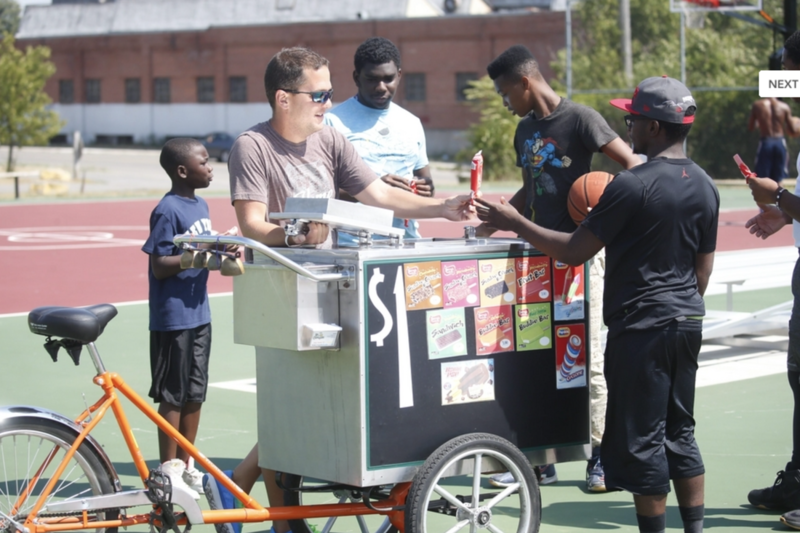 James Karagiannis, also known as the “Ice Creamcycle Dude,” stops to give out ice cream in a park on Buffalo’s East Side. James Karagiannis could sell the Skyway. As a kid, he sold his drawings door-to-door to neighbors on Colton Street. Many were willing to pay more than the price on the tags he attached to each artwork. At School he sold candy out of his backpack until the principal ordered him to stop. A determined entrepreneur, Karagiannis created a candy catalog with order forms – and sales increased. Now, at 36, Karagiannis is sold on his city. So much so that he has built his ice cream cart business on serving the underserved. On business days, Karagiannis and his crew leave the North Buffalo headquarters of Ice Creamcycles pedaling three-wheelers, each pulling an ice cream cart, to destinations on the East Side, West Side and Riverside. There, they sell ice cream and frozen novelties for $1 apiece. “We’re driving through inner-city neighborhoods,” said Karagiannis, who started his business in 2007. With his reflector sunglasses and sneakers the color of a blueberry Popsicle, Karagiannis is a familiar sight in many parts of the city. There, he is known as James the Ice Creamcycle Dude. But after almost a decade in business, Karagiannis still feels the sting when saying no to a kid who doesn’t have a dollar for ice cream. So he and his drivers keep a stash of freebies to give to children who cannot afford a frozen treat. Still, nothing is free, he said. So he asks the youngster a math or history question. Whose picture is this? he asks, unrolling a dollar bill from his pocket. Karagiannis hints heavily until the youngster answers correctly. George Washington? the youngster says. And Karagiannis hands the child a frozen treat. Word about Karagiannis’ method spread. Other customers began to kick in donations of $5 and $10. It became difficult for his mobile crew to keep track of the donors. Once again, Karagiannis tinkered with the business plan. “We came up with the idea that, if they want a free ice cream, they’d have to write a thank-you note,” he said. The notes were mailed to the people who donated. Those notes later morphed into postcards designed by Ezekiel Miner, a freshman at Buffalo Academy for Visual and Performing Arts. “The kids totally get it,” Karagiannis said. Karagiannis is a 1999 graduate of Bennett High School. He finished two years at Northeastern University in Boston, where he studied business administration. He admits to an “extreme wanderlust” that last winter took him to New Orleans, where he pedaled bicycle cabs. This October, he’s heading to Seattle. He once started riding his ice cream cart to New York City, but only made it to Medina. Among his crew of Ice Creamcycle dudes is Hakeem Salem, 18, a recent graduate of City Honors School. Salem is heading to Boston in September to attend the Massachusetts Institute of Technology for computer science. Peddling ice cream is his best summer job yet, he said. Occasionally, Karagiannis and his crew work the Bidwell concert series on Tuesday evenings or the Art of Jazz Series on Sunday afternoons at the Albright-Knox Art Gallery. On a typical day, they don’t set out much before 2 p.m., averaging 15 miles total as they make their way to some of the city’s less-traveled neighborhoods.